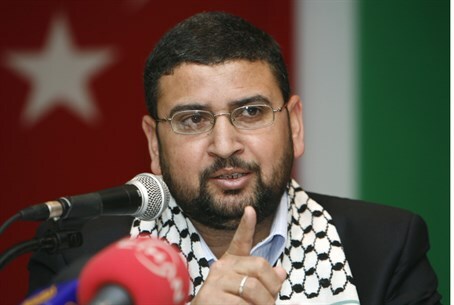 Hamas spokesperson places 'personal responsibility' on Abbas for lethal arson, claims it 'wouldn't happen' if Hamas controlled region. Hamas spokesperson Sami Abu Zuhri has accused Palestinian Authority (PA) Chairman Mahmoud Abbas with bearing responsibility for the death of an Arab infant in the village of Duma in Samaria on Friday, which came during an arson attack the IDF suspects may have been committed by Jewish extremists. "I call on Abbas to stop pursuing Hamas in the (West) Bank, and place on him personal responsibility for the burning of the infant Ali Dawabsha, due to his harassment of resistance fighters," said the terrorist spokesperson. Even though the identity of the perpetrators of the lethal arson attack remains unknown, condemnation has come in fast and furious from Israeli politicians, the EU, UN and US, with "settler" violence being assumed to be the culprit. Abbas responded by announcing Friday he intends to sue Israel for the arson at the International Criminal Court (ICC), which the PA joined on April 1 in a unilateral move that breaches the 1993 Oslo Accords which formed the PA.
Hamas for its part called for Arabs to attack IDF soldiers and "settlers," saying they are all "legitimate targets, in any location and situation." Those calls were answered by wide-scale Arab attacks in Judea, Samaria and Jerusalem on Friday and Saturday, in which Arab rioters hurled rocks and firebombs at Israelis, soldiers and homes - which easily could have set off a fire in a potentially life-threatening incident of a similar nature to the arson attack on Friday.